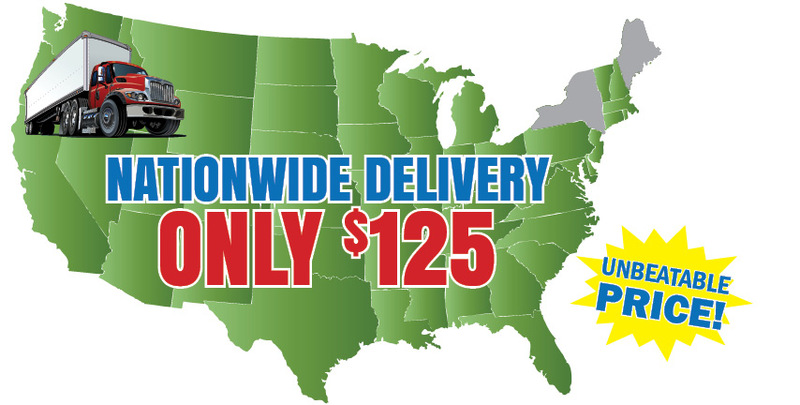 That’s right $125 delivers nationwide* to the continental US on all metal products! Get everything you need for your new metal roof, metal siding, including trim and fasteners, delivered directly to your job site. So not only do you get the best price on metal roofing and steel roof panels, awesome delivery is also included. Call our experts today to get a quote for roofing & metal siding. (866) 520-5515. Please note the following terms and conditions required for delivery. In some areas there are restrictions prohibiting delivery. Additional delivery fee may apply for jobsites that extend 25 miles beyond a main highway. Your customer service professional will contact you prior to processing your card with a delivered total. Machinery is required in most areas to properly and safely unload your material. You are responsible for the cost and acquisition of such machinery Ex: using a forklift is probably the best way to unload the material. Check your local rental center for availability. Our driver will call you with advanced notice in order for you to be ready for unloading. In some areas the delivery truck will have the ability to unload the material for you. All material (metal shingles, steel roof panels, metal products, metal siding, etc…) is unloaded to the ground. Rooftop delivery is not available. Your order will be delivered on a semi tractor trailer combo in the excess of 70′ long. This requires sufficient space to get in and out of your job. The driver has the sole discretion of this decision. Unfortunately your order may not drop in the exact area that you require. Please be aware we will do everything possible to serve you well. The limitations of the truck will decide the availability for each drop area. A jobsite delivery form will be required from you prior to ordering and processing your job. This form will be provided after the checkout transaction. By using MetalRoofingDirect.com I claim that I understand and accept the delivery terms as stated. I agree to pay for additional costs involved in deliveries that are scheduled to an incorrect address or if the address scheduled is not the actual jobsite. Any changes that are needed are required to be made by you to us prior to the load date of your order. Once the truck is loaded the schedule cannot be changed.